While I don't know who first made the above statement, I'm pretty sure they must have made it before LED flashlights powered by lithium batteries became available. Reliable lights are a near necessity while cruising and LED's have made it so battery powered lights use very little energy while still providing bright, usable light. This past season I made a wholesale switch to LED's on our sailboat, both in the cabin fixtures and flashlights we carry. I'll save my thoughts on using LED's in cabin fixtures for another post, but today I want to shine the spotlight on a brilliant little flashlight. I'm not going to profess to you that I've found the holy grail now that I've got an LED flashlight. In fact, I'm guessing most of you probably already have one too. They've become so common now that you can buy them at the dollar store and throw them away for a new one when the batteries go dead. But my experience with these cheap LED flashlights is that they are poorly constructed (really crappy switches!) and use low quality LED's that don't provide much brightness or reach. 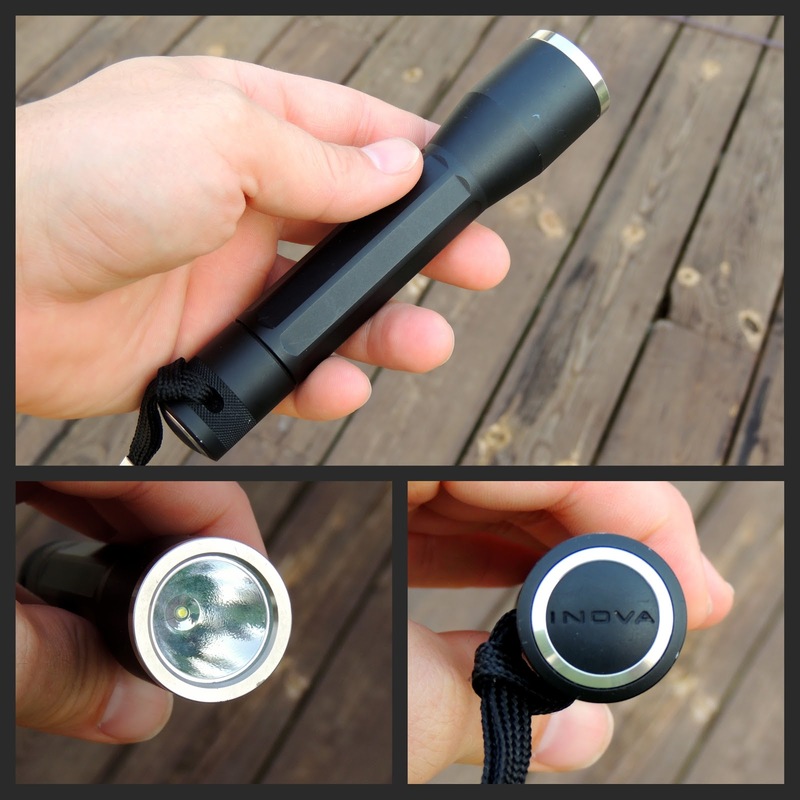 Enter the INOVA XO3 from NiteIze. This is a serious flashlight. First of all, the XO3 is powered by 2 lithium batteries (123 series) that give 40 hours of run time on low power or 3 hours of run time on high power. I've found replacement packs of these batteries at Target for about $5 a pair, but I haven't had to replace mine yet even after a full season of use. The light from the LED is bright white in color and provides 200 lumens on high power and 18 lumens on low power with an effective range of up to 636 feet. Those numbers may not mean much, but if you compare them to the dollar store LED flashlights you'll notice a night and day difference (excuse the pun). This is remarkable considering the XO3 uses only a single LED rated with a 70,000 hour service life. The body of the flashlight is constructed of high-grade aluminum with an anodized finish in either black or titanium. Best of all, it's waterproof and impact resistant to 3.3 feet. While the XO3 flashlight isn't cheap, I've never seen a more durable and bright portable light. The low power setting is perfect for checking the deck, walking down a dock at midnight, or looking at sail telltales on a night passage. The high power setting typically isn't needed, but it's great if you want to shine the far reaches of the bilge looking for the nut you just dropped, or illuminating the engine compartment during a high seas repair. We even use it as an on-deck spotlight to shine channel markers and mooring balls when coming into a new harbor at night. Do yourself a favor and put the dollar store flashlights in a backup role and get an INOVA XO3 as your primary flashlight.